When building your storage tank system, it’s important to not only carefully consider the tank itself, but also the fittings and accessories. An important part of your tank is your manway cover. Failing to understand the purpose and function of the manway can threaten the safety of your employees and result in leaks, tank damage, and environmental hazards. Let’s look at three things you should consider when choosing a manway cover. We’ll also introduce the best options for each consideration. The type of chemical you’re storing is a major factor in determining the right manway cover for your storage tank. We start here because certain chemicals require their own specially designed systems. For instance, water storage requires a different safety element than a corrosive or harmful chemical, like hydrochloric acid (HCl). Because HCl is highly corrosive and creates toxic fumes, you need a corrosion-resistant tank with our Integrally Molded Flanged Outlet® (IMFO®) System and a scrubber to keep fumes from escaping into the environment. HCl tanks require a fume-tight manway cover to allow the scrubber to function properly. On the other hand, hydrogen peroxide decomposes rapidly. 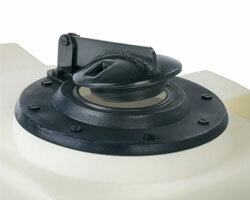 In this case, tanks often use a hinged-weighted manway cover to prevent pressure buildup from decomposition. Pneumatically filled storage tanks are put under a lot of pressure because the chemical is blown into the tank. In those cases, tank systems should be fitted with Poly Processing’s SAFE-Surge® manway cover or FS 2650 cover. The SAFE-Surge cover was originally designed as an emergency pressure-relief. The cover burps at about 0.8 PSI, then closes when the pressure is relieved. SAFE-Surge is not meant for chemicals that give off vapors. The FS 2650 is a constantly venting cover with a mushroom head. Holes are drilled under the head to allow venting, while the top of the head prevents rainwater or debris from entering the tank. It is capable of relieving a volume flow rate of up to 2650 ACFM. The FS 2650 should only be used with non-fuming chemicals. Tanks that are not filled pneumatically, such as sulfuric acid, require a bolted manway cover to seal off the tank to eliminate exposure. How will you access the chemical storage tank? The type of access you need affects the type of manway cover you should use. Hydrochloric acid requires a fume-tight manway cover to protect people and equipment from fumes. Because of its highly corrosive nature, entering the tank is not an option, and your manway should reflect that. For HCl, you should have scrubbers and a fume-tight manway in place. For water tanks, a threaded manway is ideal because water isn’t harmful and the tank will need to be drained and manually cleaned from time to time. 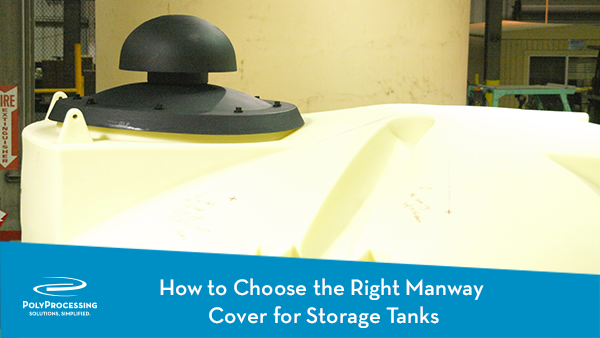 It’s no small matter to choose the right manway cover for a safe, effective tank system. The wrong type of cover can endanger your people, equipment and environment. You can rely on our 40 years of experience to create safe tank systems for any kind of chemical you’re storing. Learn more about Poly Processing’s manway covers.